Following Los Angeles City Council approval of contract terms with the Dodgers and owner Walter O’Malley on October 7, 1957, a move to negate the ordinance began. Petitions were circulated and some 51,700 signatures were gathered by November 14. Thirty days were required to verify the signatures by the City Clerk. On November 5, 1957, Los Angeles Mayor Norris Poulson stated, “From several unimpeachable sources I am told that Mr. J.A. 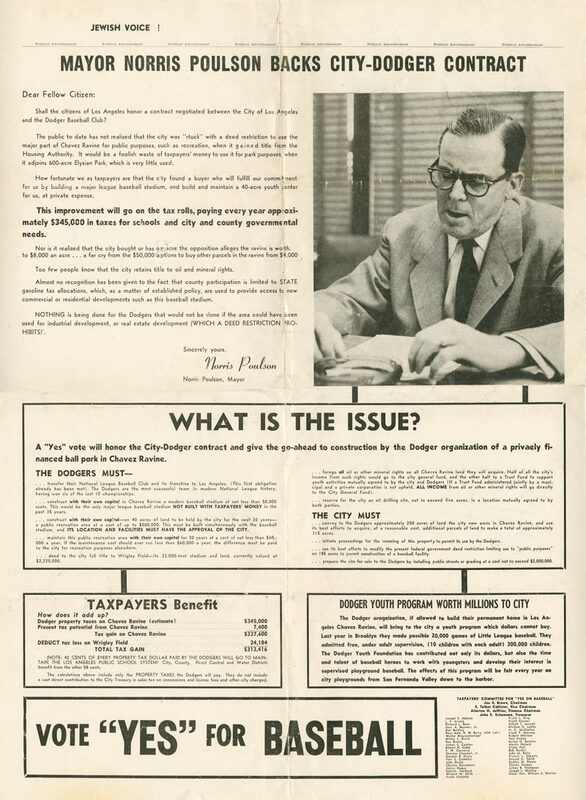 Smith is using every effort to defeat the Dodger legislation.” Poulson continued that it was with “considerable regret but with growing indignation” that he felt duty-bound to inform the citizenry that “certain financial interests, apparently with only selfish motives, have joined an effort to prevent the Brooklyn Dodgers from coming to Los Angeles.” Mayor Poulson charged that Smith “solicited several thousand dollars” to defeat the Dodgers’ move to Los Angeles.L.A. Mayor Scents Anti-Dodger Plot, New York Journal-American, November 5, 1957 By December 1957, it was announced that “Proposition B” would be on the June 3, 1958 ballot. A “Yes” vote meant that the contract with the Dodgers and the city would be approved, while a “No” vote meant the previously signed city contract would be rejected. On June 3, the largest non-Presidential election turnout in Los Angeles history resulted, as 62.3 percent of the city’s 1,105,427 registered voters cast ballots. The referendum favored O’Malley and the Dodgers by 25,785 votes, with more than 670,000 total votes cast. On May 8, 1959, the final handful of Chavez Ravine residents were removed after ignoring repeated eviction notices. “(Blackjack) Smith is a shipbuilder, canner, banker, oil producer and rancher. He also has an interest in the San Diego Padres baseball club. Murphy is a businessman here and has been active in politics.” She said today that Murphy “told me not to surrender. ‘Let them break in.’ Mr. Murphy told me that if they let Chavez Ravine go they will take the whole city. Owen was chairman of the Citizens Committee to Save Chavez Ravine for the People and Loyd was identified as a tape recording technician who was active with the anti-Dodger forces during the campaign against Proposition B.”Ibid. 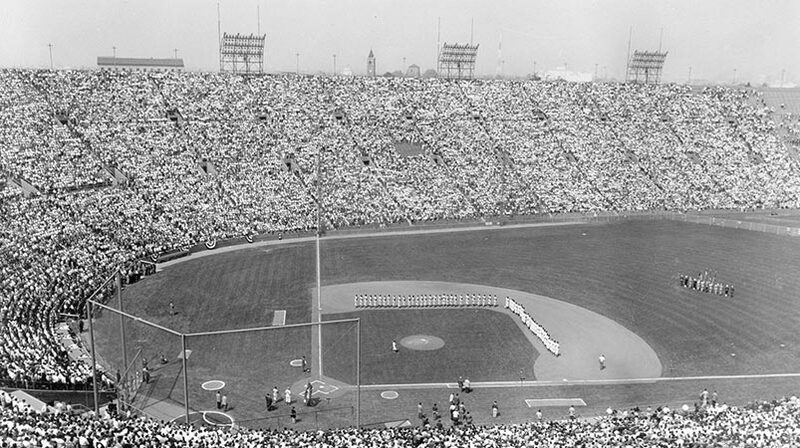 Though legal challenges did not end until October 19, 1959, the contract was eventually proven valid and construction of Dodger Stadium could proceed. J. A.’s brother – C. Arnholt Smith – was the owner of the Padres in the PCL beginning in 1955 and later became the original owner of the Padres, when the expansion team joined the National League in 1969. The person who helped bring the major league Padres to San Diego was none other than Walter O’Malley. O’Malley, along with Pittsburgh’s John Galbreath and Houston’s Judge Roy Hofheinz, led the three-man expansion committee, which recommended San Diego and Montreal. National League owners unanimously passed the recommendation. Longtime Dodger Vice President and General Manager (1951-1968) Buzzie Bavasi asked for permission to join C. Arnholt Smith and the San Diego Padres expansion team in 1968. Dodger President Walter O’Malley gave his support to Bavasi, who became President of the Padres.